There are about 70 species of tilapia native to Africa. Only a few of these are suitable for farming in ponds or other forms of aquaculture. Tilapia has been called “the aquatic chicken” and is viewed as an important food fish that is being farmed world-wide in over 100 countries. With fish populations in oceans dangerously decreasing, and the world population rapidly increasing, the need for sustainable fish sources is at an all-time high, with supply not meeting the demand. North American farm raised tilapia are well-managed, abundant, farmed in environmentally friendly ways and are on the best choice sustainable species list. In warmer climates this fish was once considered a nuisance fish because of its invasive tendencies and extremely high reproduction rate. Population control is a key component in tilapia farming. Commercial farms raise only males because of their much faster growth rate compared to females. Tilapia are not considered an invasive species in Canada due to their inability to survive our winters. Please check with your local Ministry of Natural Resources for regulations regarding raising tilapia in your area. 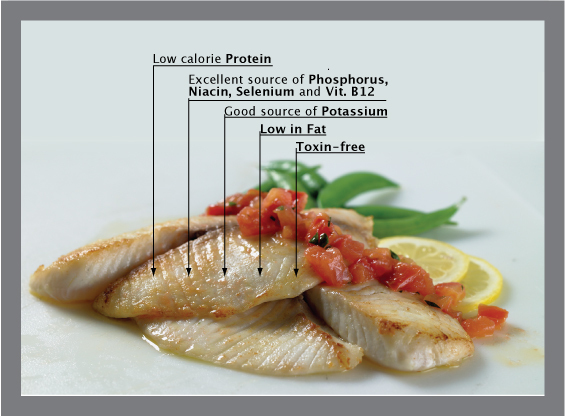 Tilapia is a nutritious and healthy part of a balanced diet that is high in protein, low in fat and substitutes well in any seafood recipe.